Taiyo Yuden Co., Ltd. (太陽誘電株式会社, Taiyō Yūden Kabushiki-gaisha, translated as Sun Dielectric Co., Ltd.) is a Japanese materials and electronics company, situated in Kyobashi, Chuo, Tokyo, that helped pioneer recordable CD technology (CD-R) along with Sony and Philips in 1988. Founded 60 years ago, Taiyo Yuden currently operates factories in Japan, Singapore, Korea, China, the Philippines, Taiwan, and Malaysia. They were well known for their recordable optical media, and were regarded by many to be the very best in the industry. In June 2015, Taiyo Yuden announced their intention to discontinue their recording media business by December of that year, citing market shrinkage, changing market conditions, difficulty while improving earnings and a hike in the cost of raw materials. The company employs almost twenty thousand people worldwide and reports annual sales of more than $2 billion. The current CEO and President is Shoichi Tosaka. The company is a constituent of the Nikkei 225 stock market index. Taiyo Yuden was established by Hikohachi Sato on March 23, 1950, in Suginami, Tokyo. In January 1973 Taiyo Yuden is listed in the First Section of the Tokyo Stock Exchange. The world's first axial leaded ceramic capacitor is developed by company in July 1976. That's branded Audio tape, known as Triad in North America, was introduced to the market in 1982. Since 1985, Taiyo Yuden has annually published Needs & Seeds (Taiyo Yuden Technical Report, ISSN 0911-5439). In October 1988, the world's first CD-R was made by Taiyo Yuden and presented to the public under the brand name That's CD-R, however development had already begun as early as in summer 1985. In 1987, START Lab Inc. was founded as a joint venture between Sony Corporation and Taiyo Yuden Co., Ltd. for the CD-R recording media business in Japan. Taiyo Yuden introduced That's Double Density CD-R with 1.3 GB storage space in 2000. In April 2003, an anechoic chamber test facility was established. Effective March 1, 2006, the power supply factory in Mexico (formerly Taiyo Yuden de Mexico, originally Zentec Inc) was sold to Tamura Corporation. The acquisition of Shoei Electronics Co., Ltd., formerly a subsidiary of Shoei Co., Ltd., took place March 1, 2007. In October 2008, JVC and Taiyo Yuden set up a new joint venture, called Victor Advanced Media. In February of the same year the world's first recordable Blu-ray Disc using an organic dye recording layer is launched. On June 11, 2015, Taiyo Yuden announced that they will withdraw from the recording media business, including CDs, DVDs, BDs, at the end of 2015. The same day, START Lab Inc. announced that they will discontinue selling optical disks at the end of February 2016. Taiyo Yuden branded products were not common outside Japan (where Taiyo Yuden media had a market share of about 60%) but unbranded CDs and DVDs were available from some online retailers. Rebranded Taiyo Yuden media could be found under Fujifilm, Fusion, Maxell (Maxell Music CD-R, Maxell CD-R Pro, and Maxell CD-R Music Pro (discontinued)), Miflop, Panasonic, Plextor, Sony (Sony Music CD-R (discontinued 2008)), TDK, and Verbatim Corporation brands. 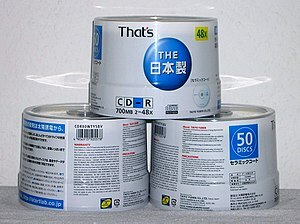 In Japan, Korea and Greece, Taiyo Yuden was distributing its own brand "That's". In October 2008 Taiyo Yuden partnered with JVC to form JVC Advanced Media as a marketing plan to distribute Taiyo Yuden media globally under the JVC brand name. Taiyo Yuden has also developed the Autostrategy technology, a learning mode for DVD burners, for Plextor. In mid-2015, Taiyo Yuden announced their intention to have withdrawn from the optical media business (including CD-R, DVD-R and BD-R) by December of that year. Taiyo Yuden sold its disc manufacturing patents and equipment to CMC Magnetics, and today the media is manufactured by CMC under the CMC Pro brand. Dongguan Taiyo Yuden Co., Ltd.
Taiyo Yuden (Guangdong) Co., Ltd.
Taiyo Yuden (Shanghai) Trading Co., Ltd.
Taiyo Yuden (Tianjin) Electronics Co., Ltd., part of Korea Tong Yang Yujun Co., Ltd.
Hong Kong Taiyo Yuden Co., Ltd.
Taiyo Yuden (Sarawak) Sdn. Bhd. Established in 1988 and located at the MEPZ 1 industrial hub at Lapu-Lapu City, Cebu. Primarily pioneered the assembly and mass production of inductors for various companies namely Sony, Nokia, Panasonic, Matsushita Electronics, Seagate, etc. Taiwan Taiyo Yuden Co., Ltd.
^ "Corporate Overview". Retrieved March 11, 2014. ^ "11-year Summary". Retrieved March 11, 2014. ^ "Consolidated Financial Statements 2013" (PDF). Retrieved March 11, 2014. ^ a b c "Withdrawal from the Recording Media Business". www.t-yuden.com. Taiyo Yuden Co., Ltd. 2015-06-11. Archived from the original on 2015-07-11. Retrieved 2015-06-13. ^ "Components:Nikkei Stock Average". Nikkei Inc. Retrieved March 11, 2014. ^ a b c d "Company History". Retrieved March 11, 2014. ^ "CD-Rの発明開発商品化" (PDF). Retrieved March 11, 2014. ^ "WORLD PC EXPO 2000会場レポート". PC Watch. October 18, 2000. Retrieved March 11, 2014. ^ "Taiyo Yuden to shift plants out of America". New Straits Times. October 22, 1992. Retrieved March 11, 2014. ^ "Taiyo Yuden to Acquire All Shares of Shoei Electronics" (PDF). Taiyo Yuden. February 2, 2007. Retrieved March 11, 2014. ^ a b "About Us - Victor Advanced Media". Retrieved March 11, 2014. ^ kg_evilboy (2 May 2006). "The Taiyo Yuden FAQ Version 1.04". Club MyCE. Archived from the original on 15 November 2007. Retrieved December 21, 2010. Wikimedia Commons has media related to Taiyo Yuden. This page was last edited on 3 March 2019, at 15:24 (UTC).